It may be unclear what is happening after Morsi’s ‘decisions’ to shake things up a bit. But one thing we know for sure is that these decisions are anything but revolutionary. 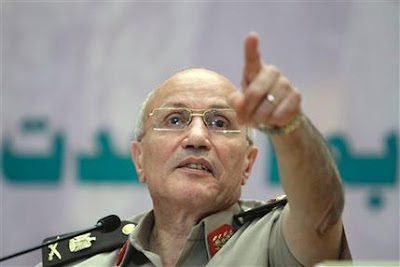 The rift within the regime was clear ever since it could not be decided whether to allow Morsi or Shafik to win. There were Tawfik Okasha’s attacks on SCAF after Morsi’s win and the mysterious death of Omar Suleiman, Sinai and the radical changes in military command. These aren’t all signs that would have predicted this move to isolate Tantawi and Anan from power but in hindsight they serve to help us understand what just happened. It is clear to me that something was planned for 24 August 2012 and that is what was pre-empted. The Muslim Brotherhood (Morsi) had to have the support of some elements inside the army so as to come out with this decision. The support of the usual regime whores like Mostafa Bakry and Ibrahim Eissa is further proof that we’re not off the mark. The isolation of Sami Anan is perhaps surprising at first glance, but in hindsight, it seems the only logical thing to do. Anan is a military man by the book which makes it likely that he has huge respect for ranking and would therefore be more likely to side with Tantawi than any of the other junior officers. He is not a popular figure inside the army either. While Springborg expected the move to be made by Anan, it seemed that he overestimated his popularity and his ambition. The opportunity, passed on by Anan, presented itself to the less senior officers who are also willing to play nice with the US. A revolutionary decision would not be celebrated by state tools. The acceptance of these radical decisions were far too smooth. Remember also that there is no propaganda channel denouncing them and it is possible that the shutting down of Okasha’s channel was purposely done in anticipation of this move. The important questions that remain are, what was the Muslim Brotherhood promised in order to give legitimacy to this coup by being a façade to the coup? What will our new authoritarian regime look like? How much power will be shared and what is the threat to the new regime? I never liked the word old regime because it wasn’t true. Nothing had changed. I’m wondering if we’ll really start to use it. Until we find out more, the important thing to remember is that there’s no reason to celebrate, it’s just another coup.